NETWORK FINALS: THE WALL and the SNL clip show gained 0.1 in final numbers, while the EMPIRE rerun lost the same. In addition, note that most of the night’s shows, including THE WALL SURVIVOR, SEAL TEAM and CRIMINAL MINDS, despite being regular original episodes, are being designated as “specials” so keep their ratings out of season averages. CABLE HIGHLIGHTS: ESPN’s NBA doubleheader towered over Thanksgiving Eve cable at 1.21 (for Golden State vs. Oklahoma City)/0.93. Hallmark’s WITH LOVE, CHRISTMAS was at 0.58. On VH1, BLACK INK CREW fell 0.08 to 0.46, and MARTHA & SNOOP’S POTLUCK DINNER PARTY was at 9,28. On HGTV, HOUSE HUNTERS INTL gained 0.06 to 0.32, and HOUSE HUNTERS was down 0.02 to 0.29, with a PROPERTY BROTHERS AT HOME at 0.30. Univision’s LIGA soccer match was at 0.31. Nickelodeon had two pairs of shows in the Top 25, the afternoon BLAZE & THE MONSTER MACHINES and RUSTY RIVETS at 0.28/0.23, and the evening PARADISE RUN at 0.26/0.23. Cartoon Network’s late afternoon BEN was at 0.25. On ID, UNUSUAL SUSPECTS dropped 0.05 to 0.25. MTV’s ARE YOU THE ONE fell 0.07 to 0.21. 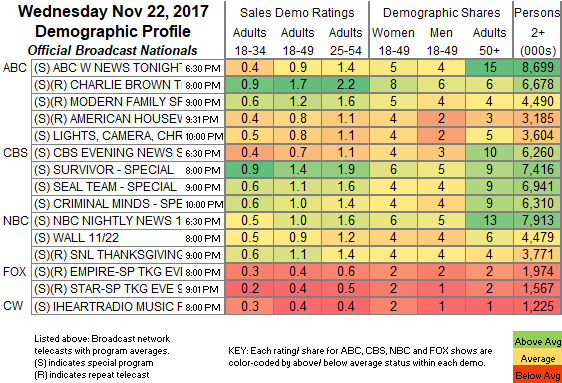 On Discovery, HOMESTEAD RESCUE lost 0.07 to 0.21. On Food Network, IRON CHEF SHOWDOWN slipped 0.02 to 0.21., and IRON CHEF AMERICA was at 0.17 USA’s MR ROBOT dropped 0.08 to 0.19. 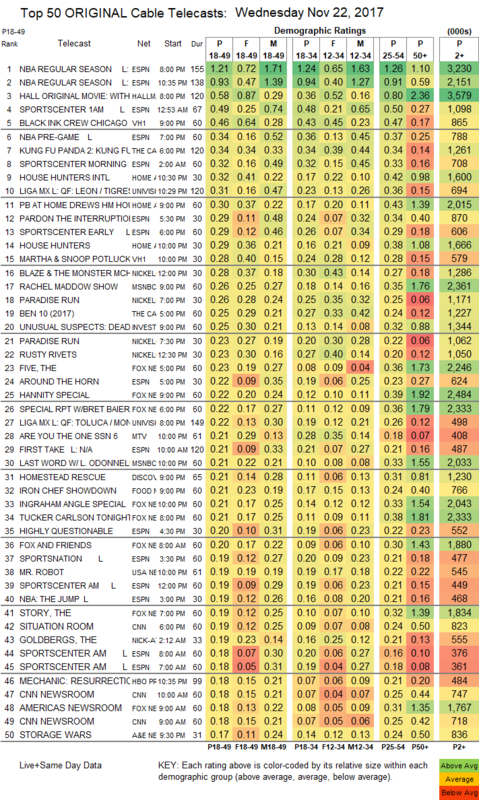 On A&E, STORAGE WARS was at 0.17/0.16 compared to last week’s 0.22/0.21, and OZZY & JACK’S WORLD DETOUR was down 0.02 to 0.17. Lifetime’s LITTLE WOMEN: DALLAS shrank by 0.04 to 0.17, and a LITTLE WOMEN: ATLANTA special was at 0.14. Spike finished with SHANNARA CHRONICLES at 0.09/0.07, compared to last week’s 0.12/0.10. On BET, FACE VALUE held at 0.08, and 50 CENTRAL was down 0.01 to 0.06. On IFC, STAN AGAINST EVIL ended at 0.07 and off the chart at 0.05/173K, compared to last week’s 0.07/0.06. Sundance’s THE A WORD remained off the chart at 0.01/73K.